Our inbox blew up about an hour ago with readers who were able to “pull” the Gingerbread (Android 2.3) update for the DROIDX. It’s tough to tell if all of these folks were “soak test” members or not, but we’ve known in the past that if the update goes live on Moto’s servers, that almost any can pull it. So if you are running stock 2.2 and want to upgrade, now would be the time to check Settings>About>System Updates. Oh, we should point out that our buddy @p3droid mentioned that you are able to SBF back to 2.3.340 afterwards in case this thing never gets rooted. 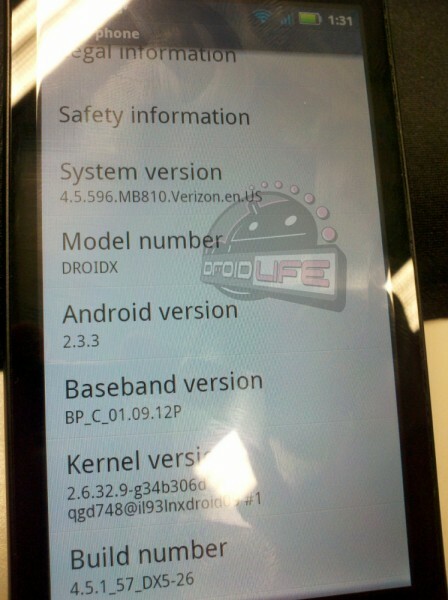 Update: P3 is already preparing a .596 update for rooted users running the leaked .595. Stay tuned, folks! Cheers L, B, J, J, and S! New DROID Bionic Running Gingerbread Gets Benchmarked, Dual-core OMAP Replaces Tegra 2?